Pre-drawn P&ID material handling symbols represent ball mill, bulk bag feeder, bulk bag loader, cone crusher, dust collector, hopper, conveyor, grinder, shredder, silo, feeder, filter, wire mesh container, etc. 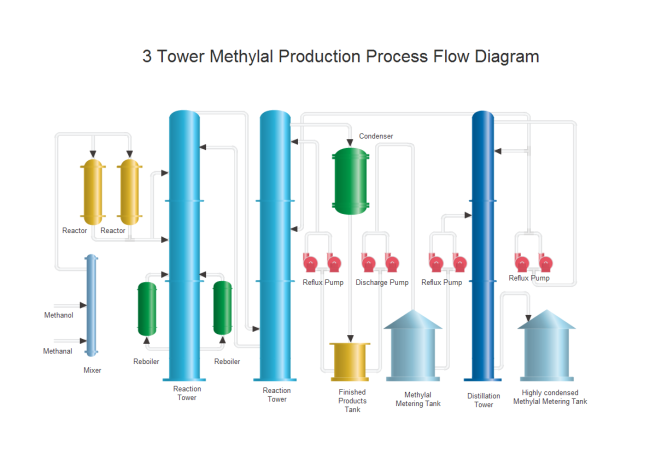 Vector symbols help develop accurate and presentation-quality diagrams and documentations. From the P&ID material handling symbols library, you will gain a great range of high quality P&ID material handling symbols. These symbols are great resources when you create piping and instrumentation diagram. Here you will have a general overview of the symbols on how they look like and how to use them in diagrams. 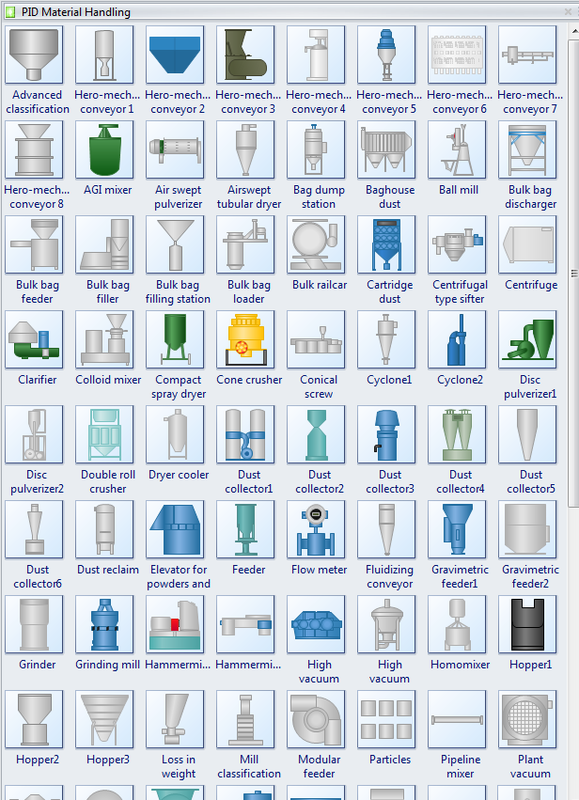 The following picture shows a screenshot of part of the material handling symbol library. It has a comprehensive collection of vector P&ID material handling shapes. You will find ball mill, bulk bag feeder, bulk bag loader, cone crusher, dust collector, hopper, high vacuum conveyor, bulk railcar, grinder, grinding mill, shredder, silo, feeder, filter, wire mesh container, truck loader, and more. Download Edraw, and you will get more than 100 material handling symbols. Clarifier is generally used to remove solid particulates or suspended solids from liquid for clarification and (or) thickening. Hammermill a mill whose purpose is to shred or crush aggregate material into smaller pieces by the repeated blows of little hammers. Silo is a structure for storing bulk materials, such as grain, coal, cement, carbon black, woodchips, food products or sawdust. Filter is a device that is designed to physically block certain objects or substances while letting others through. Grinder is a device that breaks solid materials into smaller pieces. To get access to the symbols, first you need to start Edraw. From the Available Templates, find Industrial Automation category, double click the Process PID drawing template to start a new drawing page, you will find this material handling symbol library opened on the left of the canvas. Choose a shape from the library and drop onto the canvas. The shapes are vector graphics, which are highly customizable. You are allowed to scale the shape to any size without loss of the display resolution. There will be no blur images. You are able to freely change filling colors to suit your own theme. Tips: If you want to change the filling color for a part of a shape, first you need to select the sub shape. Click on the sub shape you want to change color for a few times until you successfully select it (there will be a blue selection frame), then you can change this sub shape with a new color, and with other parts unchanged. You are able to pull out the drawing components to create new symbols. To do this, first you need to click Ungroup button to ungroup the shape under Home menu. In order to help users increase the understanding on how to use the symbols, here an example is presented. Edraw pre-defined PID symbols enable users to experience a fast and easy way in creating P&ID and PFD documentations.